Gartner thinks that the Big Data hype is going to die down a little for the lack of progress… (see here) Companies without web-scale, big, data are finding it hard to do anything commercially interesting… still CIO’s sense that Hadoop is going to become important. This post provides a suggestion that might help you to get started. 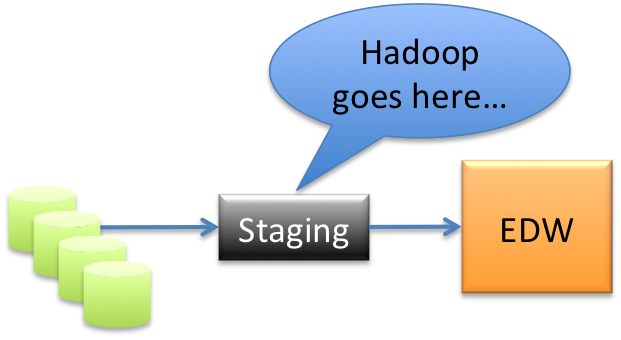 In most data warehouse eco-systems there is an area, a staging place, where data lands after it is extracted from the source and before it is transformed. Sometimes the staging area and the ETL process are continuous and data flows through the ETL hardware system without seeming to land… but it usually is written somewhere. The fact is that often enterprises only move data to their data warehouse that will be consumed by a user query. Often users want to see only lightly aggregated data in which case aggregation is part of the ETL process… the raw detail is lost. A great example of this comes from the telecommunications space. Call details may be aggregated into a call record… and often call records are sufficient to support a telco’s business processes. But sometimes the detail is important. In this case the staging area needs to become a raw data warehouse… a place where piles of data may be stored inexpensively for a time… possibly for a long time. This is where Hadoop comes in. Hadoop uses inexpensive hardware and very inexpensive software. It can become your staging area and your raw data warehouse with little effort. In subsequent phases, you can build up a library of the jobs that need to look at raw data. You might even start to build up a series of transformations and aggregations that might eventually replace your ETL system. This is what Sears Holdings is up to (see here).